Two teenagers have been charged after a city centre stabbing in which a man was seriously injured. A man in his 20s was stabbed near Holliday Street in Birmingham during the early hours of Sunday. 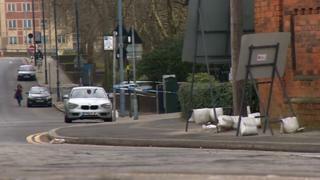 The victim, who has not been named, remains in a critical condition in hospital, West Midlands Police said. Two 17-year-old boys are charged with wounding, robbery and possessing a knife and are due to appear before Birmingham Magistrates Court later. Det Insp Greg Evans said the force is still keen to hear from anyone who may have any information about what happened. Image caption The injured man remains in a critical condition in hospital, police said.